All photos by Wayde Petersen. The last in this year’s series of Grand Final scoreboards is from the last of the Victorian Grand Finals to be played each year. The Gouburn Valley Football League play their season finales the day after the big shindig at the MCG. This year Deakin Reserve at Shepparton hosted that one Sunday in September. Wayde Petersen, our loyal Goulburn Valley correspondent, took some photos and sent some details. In the seniors the Kyabram Bombers defeated the Shepparton United Demons by 51 points, after the Demons got to within six points at 3/4 time. Kyabram we’re wayward in front of goal in a swirling wind at Deakin Reserve, missing several chances to put Shepparton United away. The Demons came back with six goals in the third quarter (they had only kicked one goal up to 1/2 time at that stage), and I felt that they were going to run over the top of the baby Bombers. 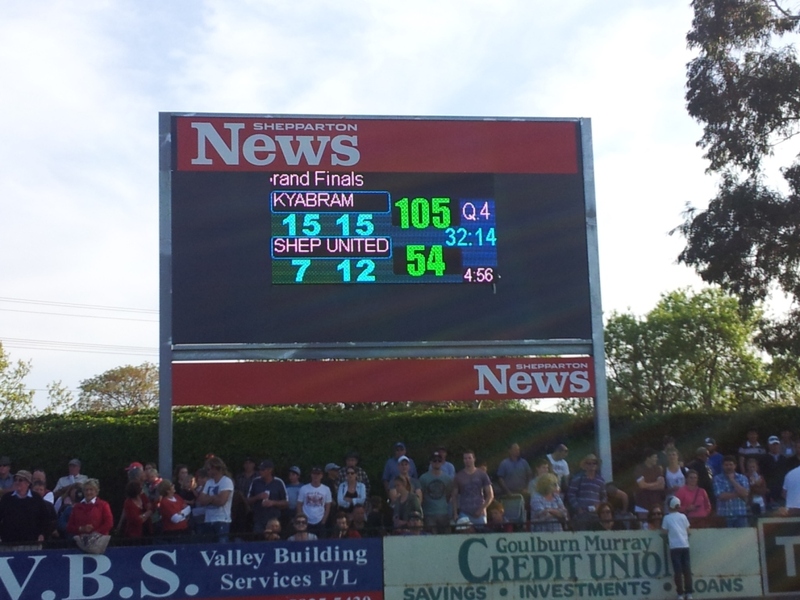 But Kyabram settled and got four goals early in the last quarter, which opened the floodgates. Shepp United decided if they couldn’t win on the scoreboard, they would win the fights, and a melee happened in the last five minutes of the game. 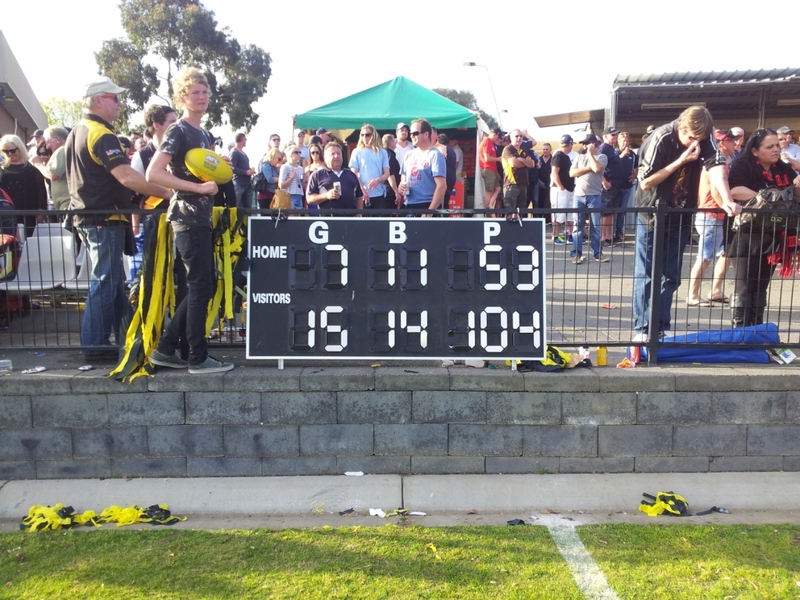 Kyabram went onto record a 51 point win, their first premiership since 1996. And a popular win according to most local footy fans. Almost siren time in the GVFL Senior Grand Final. Each team scored one more point. 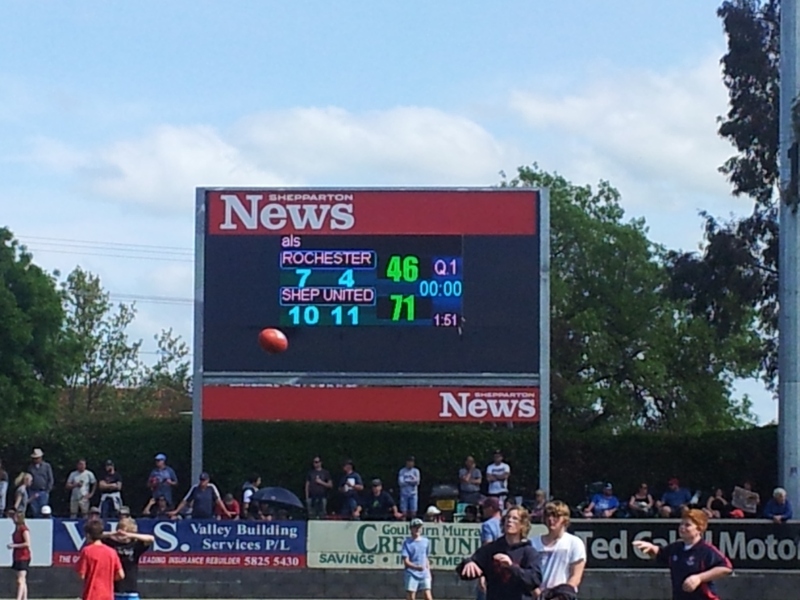 In the seconds Shepp United had an easy win over the Rochester Tigers. Time for a kick, between Grand Finals. Final score of the Reserves.